THE DAY THE EARTH STOOD STILL is another example of classy, big-budget sci-fi, though less luridly fun than FORBIDDEN PLANET. Its casting does suggest that the slightly flat acting of previous entries in this series was a deliberate choice, as if character quirks would be too much for an audience to take in a movie whose whole premise is quirky. This is the A-picture version of bad B-movie acting, so it’s not actually inept, just kind of flat. Except Patricia Neal, we can agree about that. Michael Rennie arrives from space to deliver a warning to all of Earth, but all of Earth can’t agree on a meeting place to listen to him. It’s a film about stupidity. Rennie’s Klaatu has a high-handed, “What fools these mortals be” attitude, a loftier version of George Reeves’ Superman, characterised by tiny ironic smiles whenever any of us says anything stupid, which is most of the time. This is, arguably, mainly a film about stupidity. This makes sense of Snub Pollard appearing as a cab driver. Planet Keystone. There’s potentially a good comedy to be made about an alien visitor thwarted by our dumbness, but somehow I don’t think VISIT TO A SMALL PLANET is going to be it. 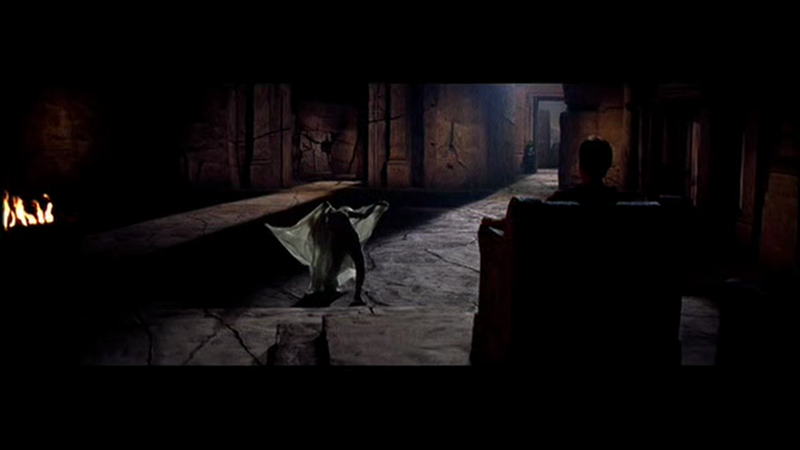 I think as a kid I was riveted by the opening of this one, and I still am — it has very good FX work but it’s primarily an achievement of editing — Robert Wise shows his cutting-room origins in all his best sequences, whether the film is WEST SIDE STORY or THE HAUNTING or CURSE OF THE CAT PEOPLE. Though the three speeded-up shots of fleeing crowds are TERRIBLE. I think I was a little bored by some of the talkie bits, and some of the running around backlot streets, but perked up for anything involving the UFO and the robot. I still feel the same way. It’s a lovely flying saucer, especially the interior (motion-sensitive controls!) and Bernard Herrmann’s throbbing, electronically-enhanced score feels literally part of the control room’s feng shui. Maybe because a theremin, like this saucer, can be operated without touch. 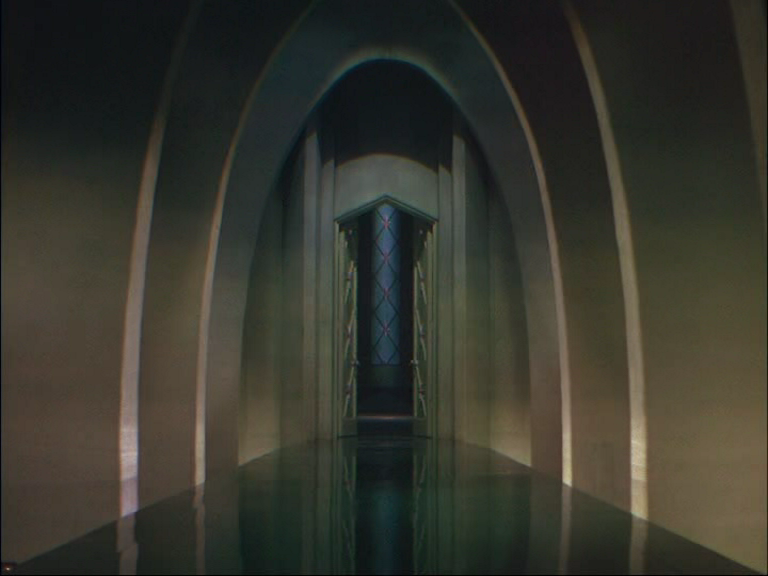 Also at times the score sounds exactly like CITIZEN KANE’s approach to Xanadu but with added electro. I want to bathe in it. Fiona recalls being unimpressed by Gort, the titanic robot. A highly critical eight-year-old, Fiona. “I didn’t like the way his joints creased.” I would defend that by saying that if you coat your robot in a kind of flexible metallic skin, which seems to be what Gort’s got, you have to expect it to fold at the joints. But I agree there’s something not quite pleasing about the look of it. He’s a character who works great as a still image, on the poster, and indeed he spends much of his time as a menacing sentry, even immobilized in a plastic cube at one point. His first entrance is unseen — everyone looks up and he’s simply THERE, in the hatchway, like Mrs. Danvers. Wise shoots around awkward movements like picking up a fainted Neal, and pulls off effective forced-perspective illusions to make him seem bigger than he is. Gort is dressed for the swimpool: shorts, goggles and wristbands — to store his locker-room keys — he needs two because he’s big. It would be interesting to see what he wears when he’s not going swimming. I think the filmmakers may have missed a trick by not having the big outage occur at night, so you could at least have a dramatic blackout. Wise cuts to different countries around the world but it’s daylight everywhere. So all you get is stalled traffic and a stuck elevator. Somehow the global power cut doesn’t kill anyone, but Fiona was sure some of the little animated figures in the park were directly UNDER Klaatu’s saucer when it landed — smushed to patê, the poor beggars, never to be seen again, their feet presumably curling up underneath, Witch of the East style. Apart from Klaatu, Gort and Snub Pollard, the film features Dominique Francon and the High Lama. Weird how other movies used this as an ur-text, even plagiarising the cast. Patricia Neal romances a space invader in the inferior STRANGER FROM VENUS (aka IMMEDIATE DISASTER, which is hilariously apt). Little Billy Gray, fifteen years later, is staunch in THE NAVY VERSUS THE NIGHT MONSTERS. Hugh Marlowe, Neal’s awful boyfriend, stars in EARTH VS THE FLYING SAUCERS, which is like the lamebrained twin of this movie — instead of visiting Washington monuments, the saucer-people disintegrate them. Despite my love of Harryhausen I’ve never really been able to love that film, it’s too much of a militaristic counter-response to TDTESS. I should also mention that this is really Gort’s second appearance in this season: Lock Martin, minus his robot costume, plays a circus giant in THE INCREDIBLE SHRINKING MAN. He’d also be a mutant in INVADERS FROM MARS. I feel like Gort is also an important figure in terms of the whole look of Marvel Comics, somehow. Ultimately, it transpires that Klaatu is here to deliver a blood-curdling threat, essentially treating the Earth the way the US treats other nations with regard to nuclear weapons: We’re allowed to have them because we’re civilised. You’re not, so you’re not. And then he buggers off. The abruption of the ending is great — scifi/horrors that bring up their end titles as soon as the threat is dealt with are usually lousy — no subtext, no characterisation, hence no coda. But here, we don’t need any discussion as the climax of the film is actually a speech — it’s one of the few films outside of THE GREAT DICTATOR to go that way, and it feels like there’s a slight relationship between Chaplin’s anti-fascist film and Wise et al’s anti-nuke one. 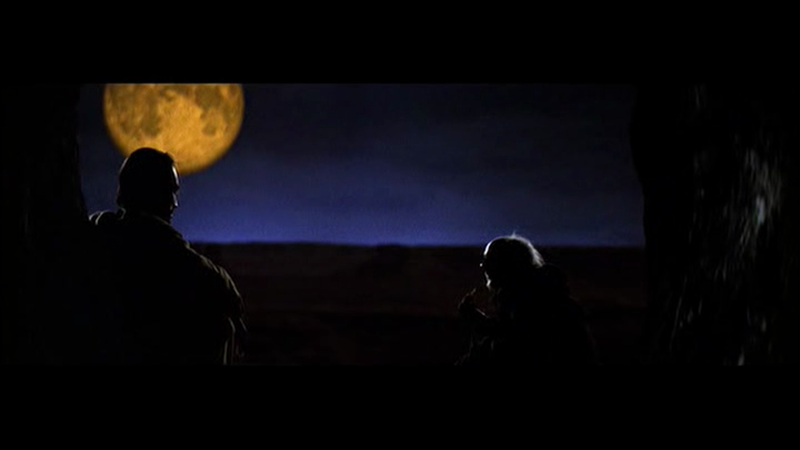 What worries me is that, having seen the way human beings think and operate in this film and in real life, we can be reasonably sure they’d immediately start trying to find loopholes in Klaatu’s unambiguous ultimatum, leading to potentially the shortest sequel in Hollywood history: THE DAY THE EARTH BLEW UP. 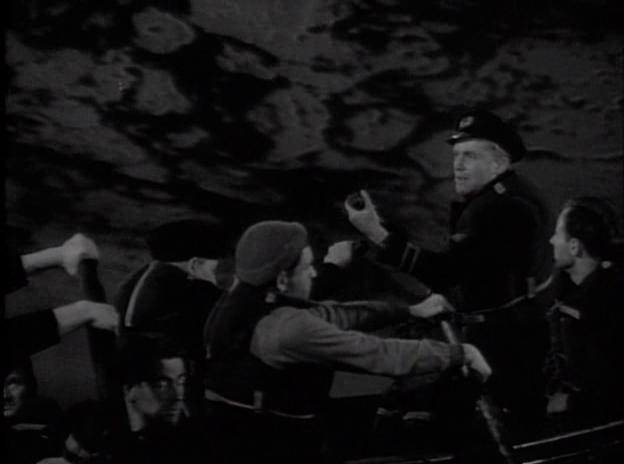 First up, THE BIG BLOCKADE (1942) isn’t purely a sea picture, it’s about the economic war on Germany. It’s pure wartime propaganda, Ealing’s bit for the war effort, just over an hour long and a kind of sketch film, written by former Hitchcock collaborator Angus MacPhail. Forced jocularity and British actors playing Germans and Italians and Russians. Historically interesting, of course. The Germans are the baddies — we’re encouraged to laugh as the factory management are threatened with Dachau if they don’t keep up production — the Italians are just a joke. “You violate me in international law!” protests a wop captain. “Wouldn’t dream of it, old boy,” comes the dry response. 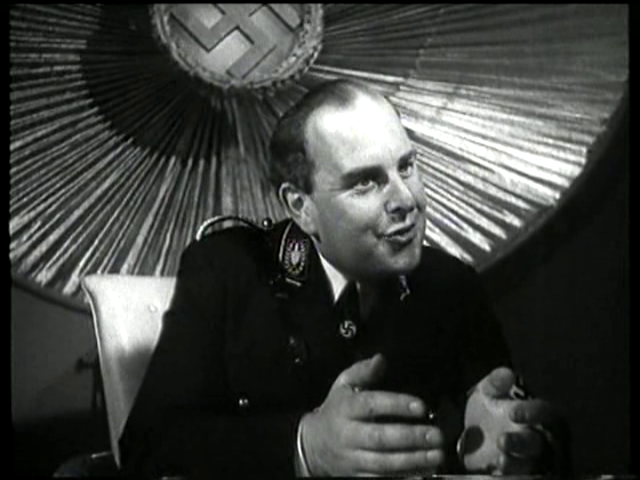 Robert Morley as a Nazi is a sight to see. Even more lip-smacking than usual. 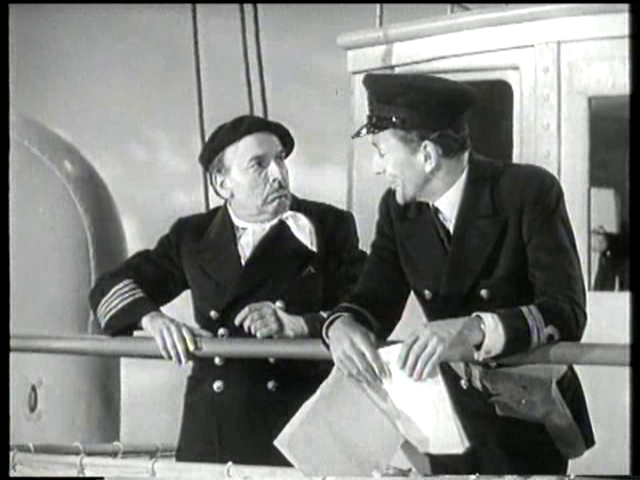 The ocean-going bit involves Will Hay, popular British comedian — certainly a better character actor than George Formby or Arthur Askey, so I suppose we should be grateful. But his whole scene is basically a lot of information shoveled down the audience’s throat without enough comedy to make it halfway palatable. In the flying bit we get John Mills and Michael Rennie — Quatermass and Klaatu! — on the same plane. No wonder we won. I enjoyed the film mainly for the model shots and the sometimes bizarre stunt casting. Nazi Germany as Toyland. Naval pictures are quite weird animals. They consist on the one hand of miniatures and special effects — the fantasy cinema of Georges Melies where everything is flimsily constructed and presented with a magician’s sleight-of-hand — and on the other hand, of stock footage, actuality material of the real war, with real waves, ships and (implied) death. In between these two extremes are the actors, sometimes on location, sometimes in sets. They have the tricky job of gluing it all together with dramaturgic paste. All Frend’s skills as a former editor are needed to maintain an illusion of cause and effect. 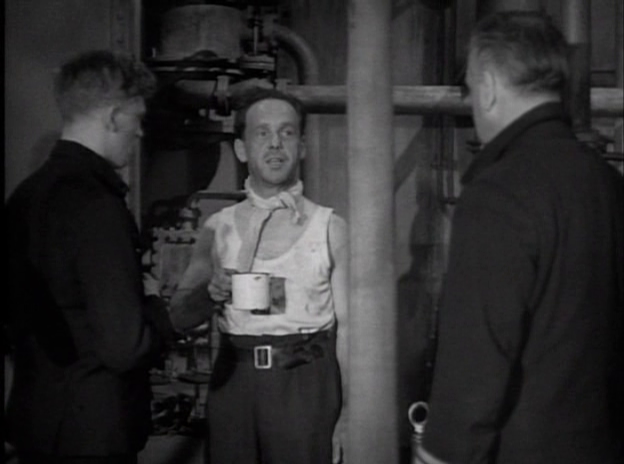 SAN DEMETRIO LONDON (1943) is Ealing Studio’s tribute to the Merchant Marines, with a no-star cast but some favourite character people turning up amid the ensemble, such as Mervyn Johns and a baby-faced Gordon Jackson. Script is by Frend with Robert Hamer and F. Tennyson Jesse, whose novel A Pin to see the Peepshow was Hamer’s dream project as director. The team concoct some amusing banter. 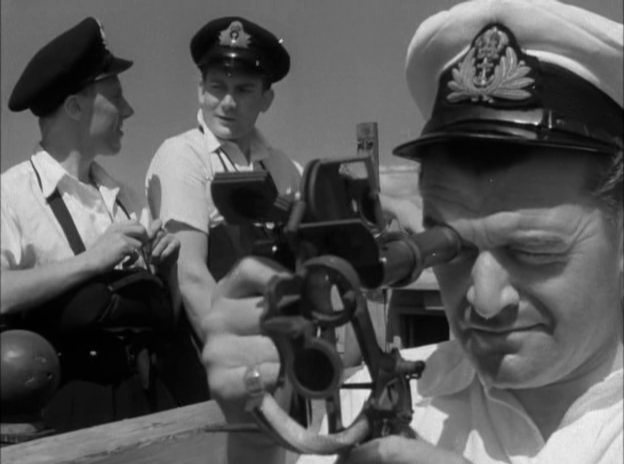 The first surprise is when the titular boat is shelled at sea and the crew have to man the lifeboats. One lot endure a rocky couple of nights in an inky ocean which is actually rear-projected in negative. It’s like the coach ride from NOSFERATU, an intersticial realm between filmic dimensions of reality — I suppose they slipped into it owing to that weird gulf between archive footage and miniatures. The second surprise is when, spotting what they think is a rescue ship, the lifeboat survivors find it’s their own bloody ship again, still ablaze but miraculously unsunk and unexploded. In a gingerly fashion, they get aboard and try to make her shipshape, since another night in the lifeboat seems unsurvivable. So what we have is a tale not of warfare but simple survival. It’s all quite compelling, low-key and restrained in the British tradition. The really touching bit involves the men getting a cash bonus for salvaging their own vessel. Ealing’s love of camaraderie and the common man shine through. 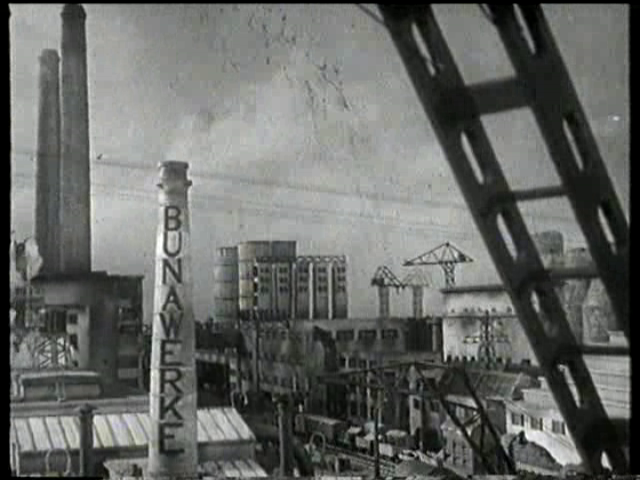 In fact, the studio was somewhat socialistic, and Ealing boss Michael Balcon was on a secret committee tasked with preparing the British public for a Labour government after the war. Here, the sailors share in the profits of their toils as we were all supposed to. 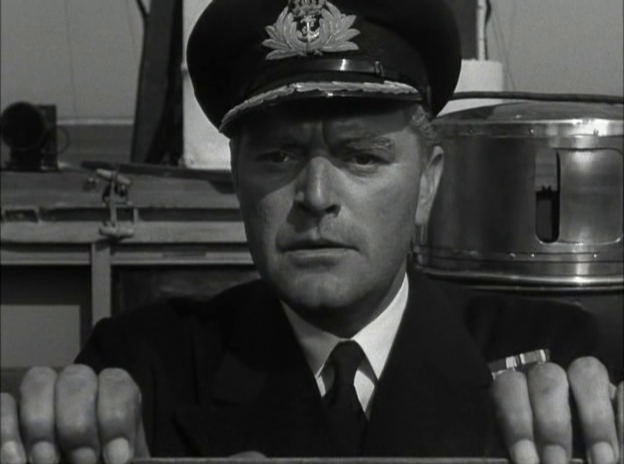 SAN DEMETRIO LONDON ends in Scotland, and THE CRUEL SEA (1953) begins there, as Jack Hawkins gets his new vessel and new crew. 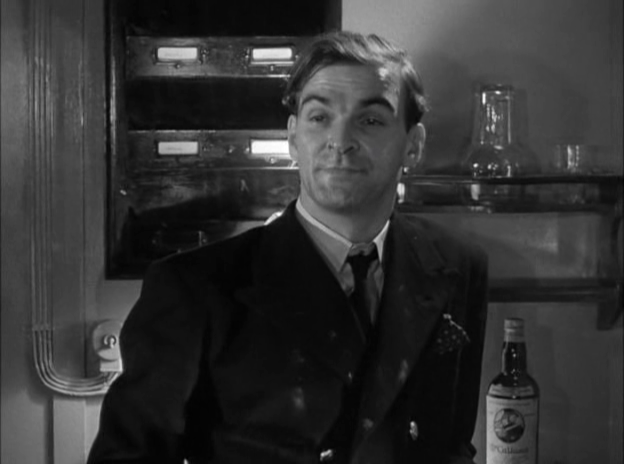 The immediate dramatic issue becomes Stanley Baker, loudmouthed first mate, a used car salesman in civilian life (the other officers are all respectable middle-class solicitors and copywriters and such). He has to be gotten rid of with what’s either a duodenal ulcer or neurotic malingering. It’s suggested that he wouldn’t have had the mental resilience for war — although two of the remaining men show marked signs of strain later. Baker certainly makes a strong impression, snarling and sneering as if on the verge of erupting from sheer class resentment. He even vomits angrily, in what must be the most shocking emetic sequence of fifties British cinema — it’s not that it’s explicitly depicted, it’s just what Baker is able to do with the power of acting alone. That man could puke for Wales. With Baker out of the picture, genteel Donald Sinden, Denholm Elliot and John Stratton supply Hawkins’ support, and the film gets into its stride. When Elliot died, Dennis Potter appeared on TV to testify to his chum’s unique ability to suggest, by the merest contractions of the muscles around the jaw, the good impulses in a bad man struggling to get out, or the bad influences in a good man struggling to get out. He’s already doing it here! The whole movie is about the psychological effects of war: living at close quarters in unpleasant conditions, fear of death, dealing with suffering and mutilation, and ultimately, being forced to make decisions that are hard to live with. The kind of material dealt with would have been impossible to show in wartime, I think. IN WHICH WE SERVE features civilian casualties and isn’t all upbeat flag-waving, but it’s hard to believe they could have gotten away with a captain sacrificing men in the water in order to depth-charge an enemy sub — that might not be there. The sequence is boldly conceived and brilliantly cut. Realizing he needed a shot of the dead bodies drifting away from the ship, a shot he’d neglected to take, Frend reversed a shot in which the bodies are coming closer. So the emotional climax of the scene features seagulls whirling in the air tail-feathers-first, something nobody ever notices since the attention is riveted upon the centre of dramatic interest. Hawkins is excellent, of course, in the role that made him. He’d been bumming around the British film industry since the early thirties, appearing in a talkie version of THE LODGER where his great jack-o-lantern head bobbles about atop scrawny scarecrow limbs, made the more ghastly by pallid greasepaint and dark lipstick. Hawkins the Death-Clown. Putting on a bit of weight was essential to balance off that vast cranium — once he turned into a toby jug he was somehow acceptable, and made a fine character player for Reed, Powell, Gilliatt, Dickinson, Mackendrick. But he wasn’t usually asked to carry so much of the show as he is here. Frend helps his actors along with some striking uses of sound, no doubt indicated in Eric Ambler’s script. As dead men float on the waves, we hear their memories, as if their brains, winding down to a long sleep, were replaying a few stuck phrases… and when Hawkins gets his new command, he momentarily hears screams coming from the speaking tube, a stray memory of the sinking of his last ship. I think these unusual effects come jointly from Ambler’s background as a novelist and Frend’s as editor, pushing the emotional dial up to a near-unbearable pitch by sheer brilliance of technique. 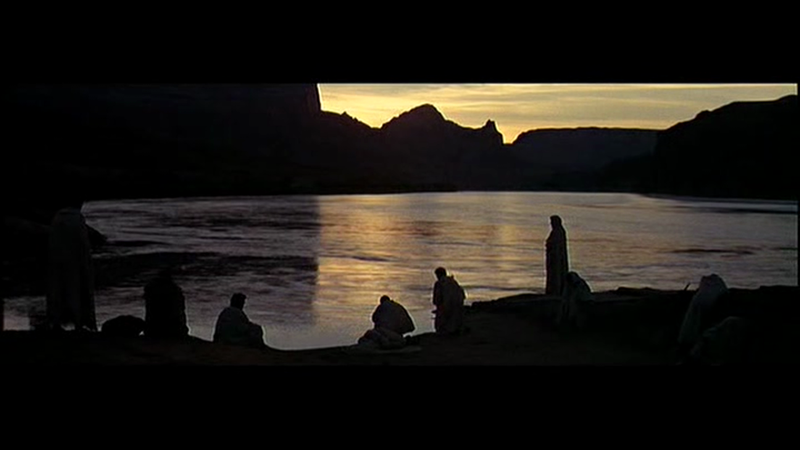 If George Stevens’ THE GREATEST STORY EVER TOLD is ever going to gain a reputation as other than a bloated yawn, I think it’ll have to be seen on the big screen. On a medium-sized TV, which is the way I saw it, bits of its aesthetic don’t altogether come off, but I could imagine they might if one were viewing with a proper home cinema type set-up, or in the wonder of Super Panavision 70. In particular, the idea of larding the screen with guest stars, then letting them linger in the background as mere specks, seems counter-intuitive, but enlarge the image and hey presto, or hallelujah if you prefer. Quick digression — a movie marketing speaker once used Mel Gibson’s sadomasochistic gay snuff film THE PASSION OF THE CHRIST to make a kind of “nobody knows anything” point about selling movies. Who could have predicted that a gruellingly violent, long, subtitled, movie set in ancient times with no real stars would be a monster hit. I felt that the producers must have suspected the thing could make money — they might have simply been indulging Mel in the hopes of milking another LETHAL MAX or MAD WEAPON film out of him, but his project was so eccentric that had it lost money it might have really done an ON DEADLY GROUND level of damage to what we must, I suppose, call his credibility. 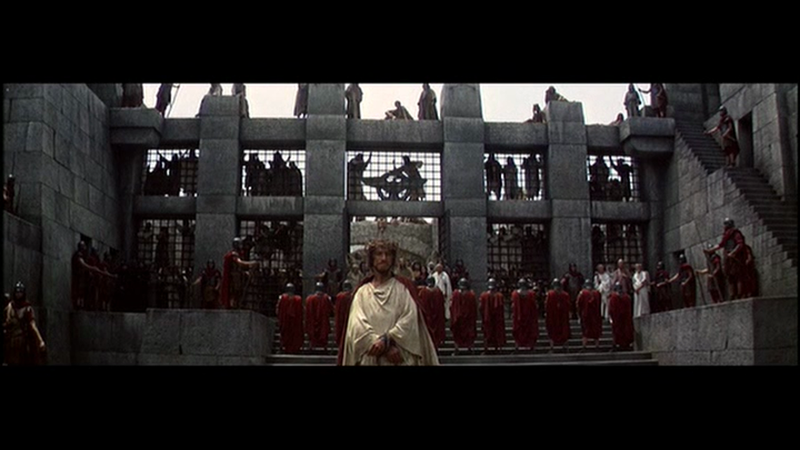 The reason the film could be viewed as some kind of commercial possibility was that Gibson’s choices added up to the illusion — and it was merely an illusion, since the dead languages used were incorrect and the levels of violence inflicted on Jim Caviezel would have crippled him long before he could have reached Golgotha — of being present at the crucifixion. And there are many among the faithful who would love to do that. You’d think the sermon on the mount or one of the miracles would be better, more spiritually uplifting than the mere nailing in and tortuous death, but a little thought and you realize that a sermon delivered in ancient Aramaic or whatever, without the aid of subtitles or a Babel fish, would be deathly dull, and miracles are just so hard to believe in. So the slow, bloody execution would have to do. Seen from this angle, the absence of stars is a positive bonus, since what we’re looking for is a simulacrum of time travel, which would be spoiled if, say, Jack Black popped up as Caiaphas, or Jessica Alba sashayed past as Martha of Bethany. The brutality, apart from exercising a suppressed part of Gibson’s warped libido, can be used to represent the concept of “realism,” and the fact that everybody’s talking foreign, obsolete languages adds to the you-are-there quality — as well as explaining why Gibson would have preferred to have the film shown without even subtitles, to complete the effect of being stranded in another time and place. “This isn’t a fantasy, this is history!” Attention to detail and the lavishing of funds on elaborate sets, costumes, and swarms of extras was the path to creating a believable story world, and George Stevens takes that philosophy to an extreme. And much of what he achieves is remarkable — a montage depicting Jerusalem as a wretched hive of scum and villainy has real grit and misery to it, reminding us of Stevens’ experience as wartime documentarist, present at the liberation of death camps. The guest stars undercut this quite badly at times — Pat Boone doesn’t really hold any significance for me otherwise his appearance as an angel would be disastrous, but John Wayne’s cameo as a centurion does deserve its place as one of cinema’s greatest ever aesthetic blunders, and even Shelley Winters — lovely, mega-talented Shelley Winters — is problematic, since she pops up for about five seconds, dominates a close shot, and then fleeteth as a shadow. It’s distracting. Mostly, I have to say, Stevens has cast well, and strong players like Martin Landau (Caiaphus), Jose Ferrer (Herod Antipas), Claude Rains (the other one) and Sal Mineo (Uriah, I think) bring either humanity or at least theatrical tricks to bear on the entertainment. This punctuates the visual splendour, which is at times almost oppressively unrelenting. Max Von Sideboard and Donald “Satan” Pleasence, under your basic bilious moon. 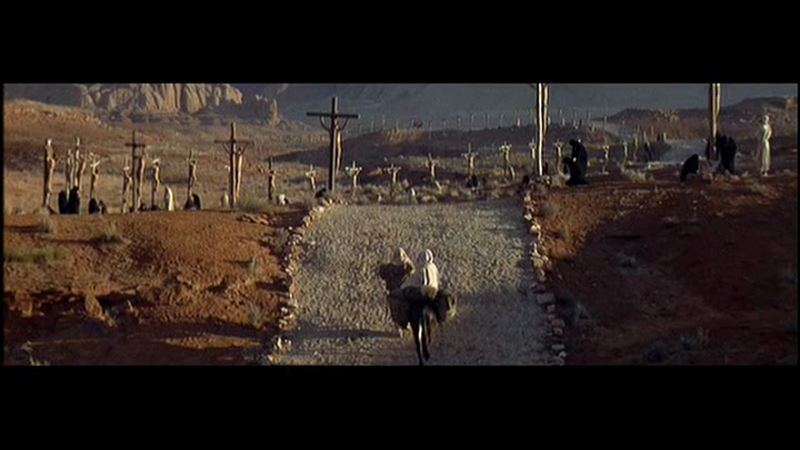 Max Von Sydow’s Jesus isn’t everybody’s cup of sacramental wine. His slow, unemotional delivery suits the rhythm of the film, but doesn’t help get the thing dancing. 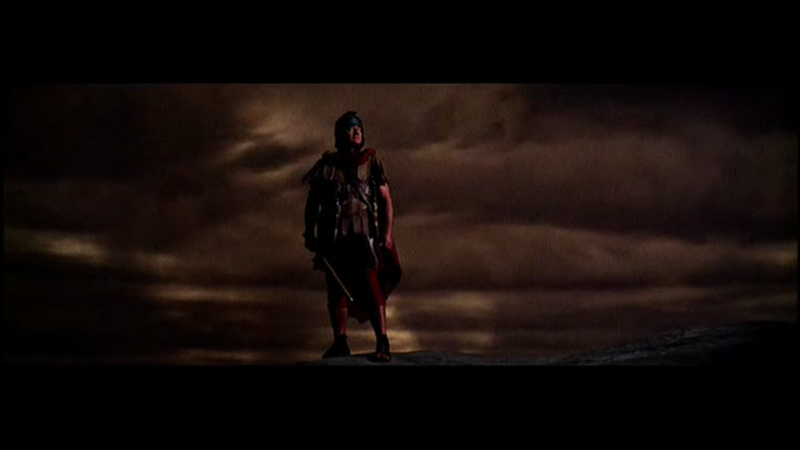 One critic said that “when he says at the end, ‘I am with you always, even until the end of time,’ it’s a THREAT.” I wouldn’t go that far — a quick comparison with Teenage Jesus Jeffrey Hunter shows what Max adds — even when he’s boring, he’s sort of interesting. At least interesting to look at. Hunter might be prettier, but pretty can be pretty dull unless enlivened by an inner spark of some kind. It seems to me that both Max and Jeffrey Hunter are playing JC as some kind of space alien (limbering up for FLASH GORDON and Star Trek, respectively), but maybe it’s just that Michael Rennie gives the same perf as Klaatu in THE DAY THE EARTH STOOD STILL: stoic, patrician, faraway look, private smiles. The same approach adapts easily to playing Abe Lincoln. Doesn’t seem to make any sense, that, but there it is. Stupendous crane shot which CLEARLY inspired the last frames of THE DEVILS. The Big Myth about Stevens is that his war experience ruined him as a filmmaker, made him shun the comedy he was so good at, and concentrate on solemn and ponderous message movies that didn’t play to his strengths. I think A PLACE IN THE SUN, for one, indicates that farce’s loss was drama’s gain. I also think that his aesthetic choices got richer after the war — more on that further down. But that’s about it. Stevens made the best PG Wodehouse adaptation in screen history (A DAMSEL IN DISTRESS) and helmed classic comedy THE MORE THE MERRIER and extremely funny adventure GUNGA DIN, and those are the only moments of humour he includes in a 225 minute epic. 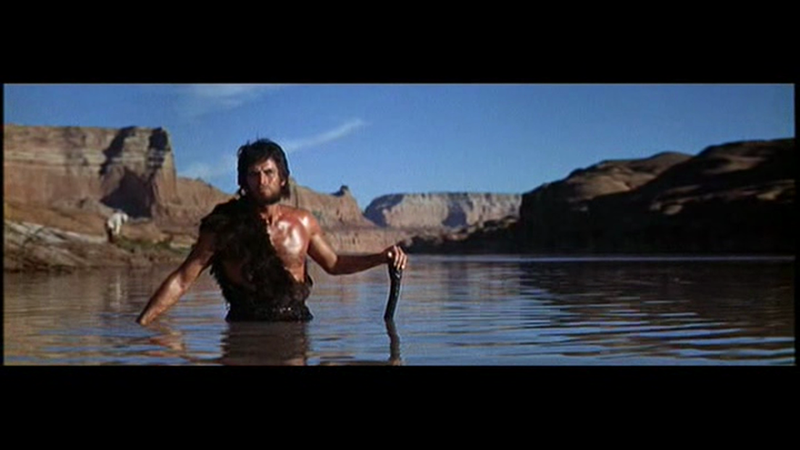 Even Charlton Heston and Telly Savalas, as John the Baptist and Pilate respectively, don’t raise many laughs, intentional or otherwise, which is an achievement of sorts. The lack of giggles is disappointing in a man who once photographed Laurel & Hardy shorts. Oliver Hardy was always stepping on nails too, but there the resemblance ends. Ethics and morality (never sure of the difference) is where Christ scores, for me. Gore Vidal points out that the whole “Do unto others” thing was said by Confucius first, but even so, Jesus did well to come up with the same admirable idea, unless God was looking over Kongzi’s shoulder, copying down what he said. The stuff about God (pronounced “Gaadd” if you’re in a biblical epic) doesn’t impress me because I consider God a good bit more fictional than Jesus, but Christ’s pronouncements on how we should behave still strike me as largely sound, leaving out the invisible superbeing stuff. Or keep Him in, if you must — theism or atheism seems to be determined by the set-up of your brain, although the choice of belief is clearly programmed by upbringing (it’s hilarious, all those Christians, Muslims, Jews, thanking the Lord they were lucky enough to be born into the One True Faith: absurd at a glance). 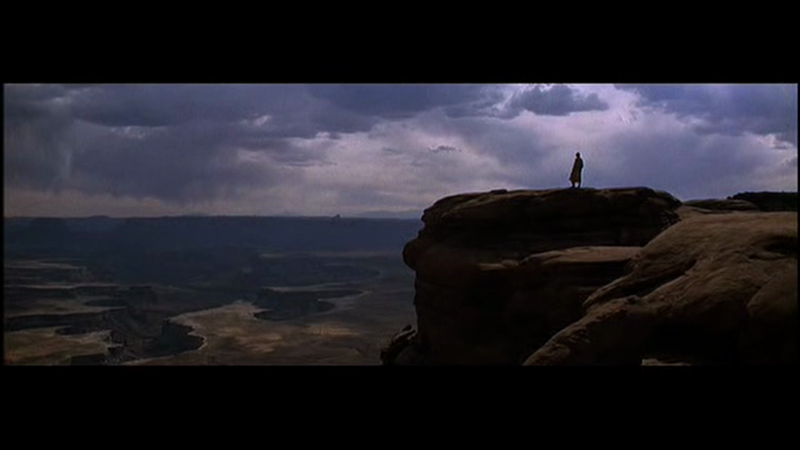 At first, I thought the Utah locations were going to make the movie play like a John Ford western, or Stevens’ own GUNGA DIN. But thanks to Chuckles here, PLANET OF THE APES is prefigured WAY more often. As delivery mechanisms for Christ’s teachings, Ray’s KOK and Stevens’ TGSET both do OK, surprisingly — there are moments where dramatic performance and visuals actually help the meaning of long-familiar prayers and parables to emerge. Both movies have enough turgidity, however, to make using them in Church perhaps inadvisable — they might work as aversion therapy on a questioning child. But I’m in favour of questions. KOK reminded me of DUNE, you may recall, but TGSET does so to such a degree that I’m sure Lynch was influenced by it. Those little snatches of internal monologue, the cutaways to weird observers, the reverse clouds of billowing smoke imploding around Christ at the end, the opening starscape, and many more touches, suggest that Lynch saw this and was on some level impressed (he would have been a teenager when it opened). I’ve written before about how odd things seems to catch Lynch’s magpie eye and get reconfigured in his movies. TGSET is so thronging with guest stars than proving overlap with Lynch’s work becomes too easy, and arguably meaningless, but I’d just like to mention that apart from the obvious Jose Ferrer and Max Von Sydow (in similar roles), we also have Roberts Loggia and Blake from LOST HIGHWAY. Although I know, because Lynch told me, that he cast Blake on the strength of his Johnny Carson appearances, and Loggia tried out for the part of Frank Booth in BLUE VELVET, Lynch inadvertently kept him waiting, and Loggia “became so angry it – just – wasn’t – funny,” which Lynch recalled when casting around for a belligerent gangster on the later film. Right after those pompous credits, ignoring the faintly ludicrous icon on Max Von Christ, the mix from star-scape to lamp flame and the moving light softly picking out the animals in the stable.This strikes me as gorgeous, atmospheric, goose-pimply stuff. WHO IS THAT doing the voice-over? He’s awfully good at it.